An Army helicopter crew chief became the first person considered to serve in the U.S. military while being openly transgender on Thursday after the Washington Post published a profile about his service. Sgt. 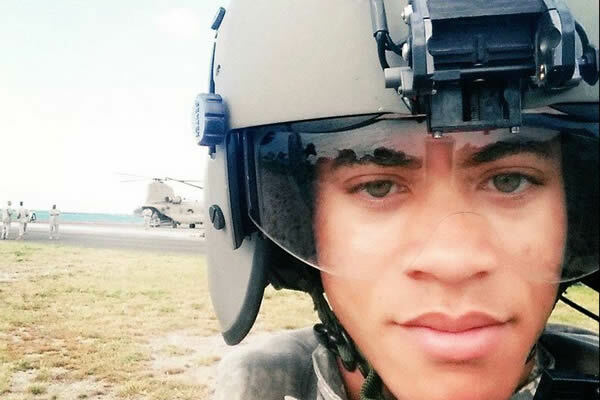 Shane Ortega, who’s 28 and stationed at Wheeler Airfield in Hawaii, talked about his commitment to the U.S. military in a statement to media outlets despite the ban on allowing openly trans people to serve. According to the American Civil Liberties Union, which is representing Ortega, he transitioned while on active duty and stationed in Fort Wainwright, Alaska, in 2011. The ACLU, which said he isn’t available for further media interviews, is calling Ortega the first openly trans soldier to serve in active duty in the U.S. military. After a voluntary psychological evaluation a few weeks ago, Ortega’s results returned negative for gender dysphoria. The U.S. Army deemed him fit to perform his normal duties without facing separation. But he’s not out of the woods yet. Ortega’s gender marker in the military’s official computer system — the Military Defense Enrollment Eligibility Reporting System, or DEERS — is still listed as female. Ortega’s command has requested guidance from the Pentagon on whether this designation means he can stay in the military or not. An Army spokesperson didn’t respond to the Washington Blade’s request to comment on whether Ortega would face adverse consequences or separation as a result of coming out as trans in the Post. Because medical tests showed Ortega had elevated testosterone levels as a result of hormones for his transition, he was barred from flight duties, the Post reports. But he expects the Army later this month will clear him to resume flying and perform all duties as a helicopter crew chief. Ortega, who has recently launched a Twitter account and was accepted into the Gay Men’s Chorus of Honolulu, is set to compete for a professional bodybuilding title in the fall, the Post reports. The repeal of “Don’t Ask, Don’t Tell” in 2010 enabled openly gay people to serve in the U.S. military, but trans people are barred from service as a result of medical regulation that the Obama administration could change at any time. Defense Secretary Ashton Carter and the White House have expressed openness to the idea of openly trans service. Although a formal review specific to the policy is underway, the Pentagon has acknowledged when asked about the issue that a broader, routine review of the Defense Department’s medical requirements is taking place, which would encompass the ban on trans service. Last month, the Army announced it has raised the authority for discharging troops based on their gender identity. Any initiated separation of soldiers for being trans must be forwarded to a senior civilian official, the assistant secretary of the Army for manpower and reserve affairs, who’ll then make a decision on possible expulsion with service headquarters. The Williams Institute of the University of California at Los Angeles estimates 15,500 trans people serve in the military, but the Pentagon doesn’t keep record of the number of service members discharged because of their gender identity. According to a recent report in the Associated Press, U.S. military leaders, speaking on condition of anonymity, have expressed reservations about changing policy to allow openly trans people to serve. Among the concerns, the AP reports, are questions about where trans troops would be housed, what berthing they would have on ships, which bathrooms they would use and whether their presence would affect unit cohesion. Joshua Block, attorney in the ACLU’s Lesbian, Gay, Bisexual, Transgender and HIV Project, said concerns about allowing openly trans to serve in the U.S. military are misplaced.